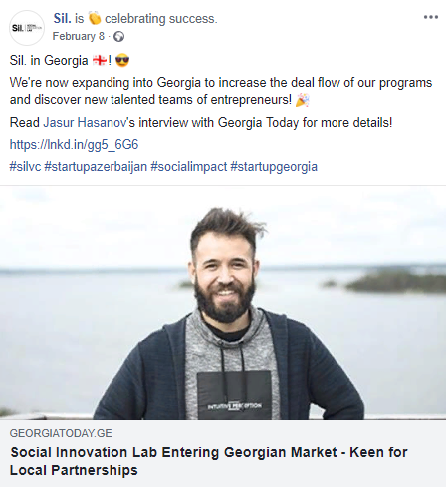 We’re now expanding into Georgia to increase the deal flow of our programs and discover new talented teams of entrepreneurs! Sil. currently runs the international ClimateLaunchpad and Creative Business Cup programs, as well as the region’s largest accelerator for early stage space startups – NewSpace Accelerator. We’re planning to bring the NewSpace and ClimateLaunchpad programs to Georgia initially, as well as our expertise in building and running innovation programs. Sil. team has been to Georgia many times before to deliver sessions on Social Innovation and entrepreneurship. Sil. decided to expand into the Georgian market firstly because a similar demand for entrepreneurship education in the market. At the same time, there are lot of potential in the market with an increasing number of talents and opportunities, like the development of tourism and other industries in the country. These developments require innovations built on local context and knowhow. Read Jasur Hasanov‘s interview with Georgia Today for more details from here!